Stroke is the first cause of acquired disability in Adults. It affects more than 17 million of people every year worldwide. Stroke is a neurological condition from vascular cause. 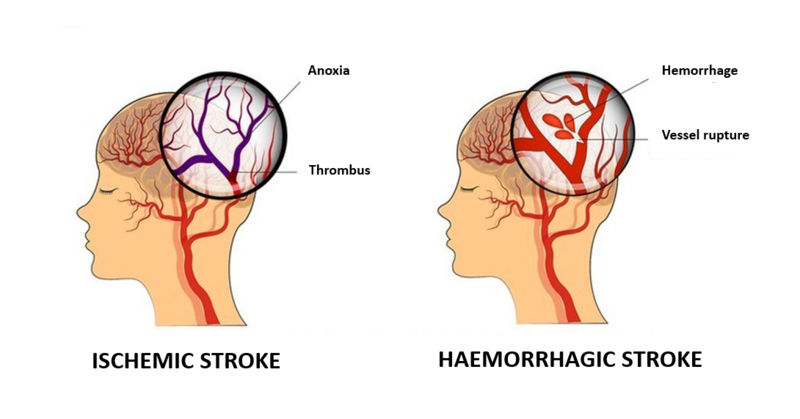 There are two main types of stroke, ischemic stroke and hemorrhagic stroke, characterized respectively by neuronal cell death associated with oxygen and nutritional element deprivation as a result of a vascular obstruction or damages due to hematoma mass-effect and blood toxicity as a result of a vascular rupture. Ischemic stroke represents 85 % of all strokes. The obstruction of the vessel is the consequence of a blood clot due to an atheromatous plaque disruption or by the migration of a blood clot from elsewhere (for example in the heart left atrium in patients with atrial fibrillation). Ischemic stroke patients may be treated by rtPA-induced thrombolysis (NINDS, ECASS, Atlantis studies) if they are managed within 3 to 4.5hrs from symptom onset. Recently, a mechanical approach called thrombectomy has integrated the latest guidelines. This treatment can be performed by an expert physician beyond 6 hours from symptom onset. Spontaneous intracerebral hemorrhage (sICH), or hemorrhagic stroke, is the second most frequent (10 to 15 % of all strokes) and the most severe form of stroke. sICH results from a weakness and the disruption of a cerebral artery leading to blood leakage in the brain. The hematoma induces an increased intracranial pressure, leading to mechanical damages to cells and blood circulation, while the iron of the blood is toxic for the neuronal cells. Until now, there is no dedicated treatment of sICH. As a consequence, sICH is the most severe form of stroke with a 10-year survival rate below 30%. Nevertheless, new strategies to stop bleeding or to safely remove the blood from the brain are in development, such as O2L-001. A total or partial paralysis. Unfortunately, and even if emergency solutions are now available for the ischemic strokes there is no specific treatment for the hemorrhagic forms of strokes and their medical management is limited to intensive care, despite the severe and disabling aftermath and the high economic impact. The medical need is therefore significant for this disease. The intracerebral hemorrhage is a public health burden, with a large economic impact, including costly disability requiring prolonged medical support beyond the hospitalization. In France, the severe consequences of an intracerebral hemorrhage are identified as a long-term disease. Which This means that all care expenses are supported by the health care system: € 12,860 per patient and per year and a direct cost of M € 1 430 per year for the long-term diseases. In the USA, the hospitalization costs are about $ 28 360 per patient and post-discharge costs are estimated $ 16 035 for the first year. With the improvement of emergency procedures, the death risk is failing. But the loss of autonomy due to disability is increasing. The « Global Burden of Disease » study, conducted in 2010 in the US, Europe and Japan shows that the economic and social consequences of the intracerebral hemorrhage are increasing, while the mortality rate is now lower, compared to the rest of the world (30% in these countries versus 50 % in the rest of the world). Therefore, there is a strong need in these countries for any new treatment of the intracerebral hemorrhage to that can decrease its economic impact.